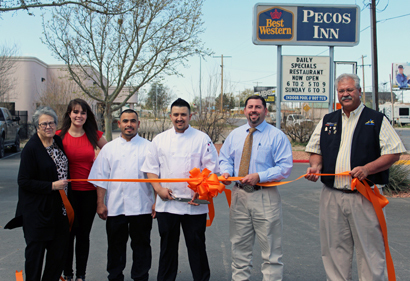 Members of the Artesia Trailblazers and employees of the Artesia Chamber of Commerce, Pecos Inn, and Chef Lupe’s celebrate the opening of the new restaurant inside the hotel, 2209 W. Main St., with a ribbon cutting this morning. Pictured from left are Sandy Johnson, Kelcey McCaleb, Victor Rodriguez, Aaron Gallegos, Jesse Brownfield and Perry Troublefield. Chef Lupe’s was formerly located at The Paddock Café in Riverside.